The recent UN Convention on Climate Change (COP 23) was held in Germany and was presided over by the Government of Fiji. Tourism Fiji wanted the world to know that Fiji is one of the most beautiful countries in the world and that eco-friendly resorts help restore and protect the environment. So, Tourism Fiji worked with Jean-Michel Cousteau and Ocean Futures Society to produce a series of promotional travel videos about Fiji. Jim Knowlton, who has produced videos for Ocean Futures for many years, traveled to Fiji with colleague and cameraman Jahmin Lerum and shot 4K video to create a library for the video series. Jim and Jahmin shot video of rainforest jungles, white sandy beaches, eco-friendly resorts and restoration projects that are improving the environmental health of Fiji. Jim Knowlton also shot underwater video of pristine coral reefs and Jahmin shot aerial video using a drone. The goal of the video series was to share how Fijians and resorts work to create sustainable ecotourism so that visitors will experience beautiful and healthy environments for many years to come. After their return, Jim edited two 4 minute videos and then 4 shorter videos for Tourism Fiji. 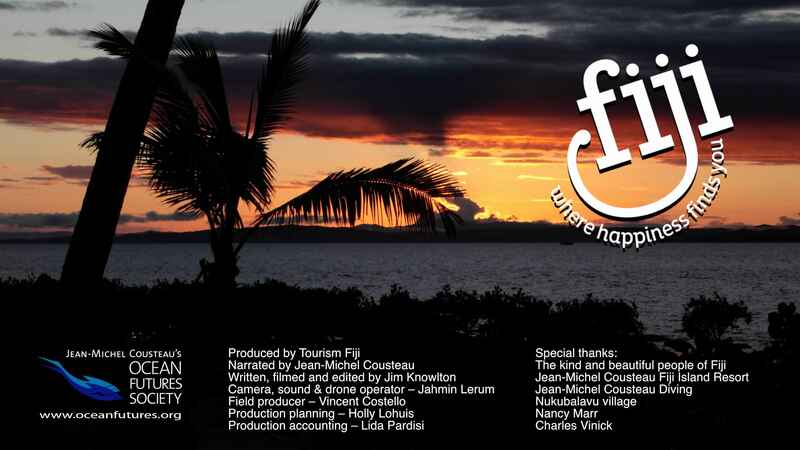 The 6 videos were also translated into French and German, so that in all there were 18 videos produced to promote the beauty and sustainability of Fiji. Jim used a Canon 5D Mark lV video camera to shoot 4K video of Fiji above and below water. Jahmin used a Mavic Pro drone to shoot 4K aerial video of Fiji.